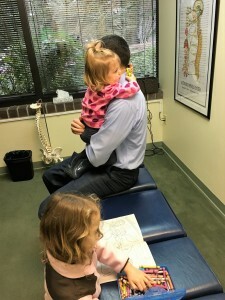 Dr. Cummins gently adjusting his children at Bellevue’s Cummins Chiropractic. Working with kids at an early age to optimize their nervous system, teach them to eat well, think well and move well – the future is bright for these kids. 50 percent of the babies born since the year 2000 are expected to live over the age of 100, according to the British Medical Journal, The Lancet. Additional research is concerned that our current generation of children may be the first in recent history to see their life expectancy go down. How can this be? Doesn’t it seem like a contradiction to see so many children living longer while their overall life expectancy goes down? The answer is sad yet simple in that the other 50 percent of children are expected to die younger and sicker than ever, not because of their genetics, but because of unhealthy lifestyle choices. Which side of the 50% will your children be? 60 year lifestyle or a 100 year lifestyle? Why are there children at Cummins Chiropractic? In 1903 Thomas Edison said, “The doctor of the future will give no medicine but will interest his patients in the care of the human frame, in diet, and in the cause and prevention of disease.” It is 2017 and the future is now. You do your part by making good lifestyle choices and we will do our part keeping the master control system of your body, your nervous system, functioning at its full potential so you can enjoy good health now, for 100 years and beyond.